School of English students were recently introduced to their second semester by multidisciplinary artist, producer and playwright, Amhara Spence. Organised and delivered by the English staff and tutors, the event was designed as a welcome back event to kick start their new term after the Christmas break. 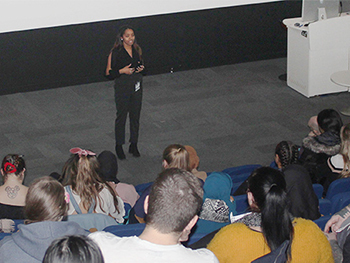 Following a welcome from the Head of School, students were introduced to special guest Amhara Spence who had come in to talk to the students about her experiences pre, post and during her degree. Amhara works with performance, text, digital art and installation and her work is particularly invested in the notions of equality, social/environmental justice, autonomy and agency. Never in my life have I known what I wanted to do, even now at this moment. You just have to believe in yourself and your own thoughts. Amhara talked to the students about her life, starting from her experience of English class at A Level. She explained her dream was to be a singer and perform with a live band, making the point that anyone can achieve their goals if they work hard and want it enough. Amhara went on to study Drama and Spanish at university and spoke of her cultural difficulties on the course, adding that each struggle she faced only led to greater ambition and determination. Thinking about delivering this talk to final year students, she delivered advice she would have liked when she was in the same position. Amhara’s visit came just ahead of her succession of performances of Concubine at the Birmingham Repertory Theatre, a play both written and performed by her. The play, which explores womanhood, sexuality and faith, is onto its second run of performances after a sold out series of shows in 2018. Amhara treated the students to a sneak peek of the play during her visit. Still in touch with last years’ graduates, Student Success Advisor for the School, Ceri Osborne, had collected a series of videos filled with advice for the current final year students. In the videos, alumni provided the students with some examples of the huge variety of paths their English degree could take them by explaining what they are doing now, what they have been doing since graduation and giving their advice for the final months of study.